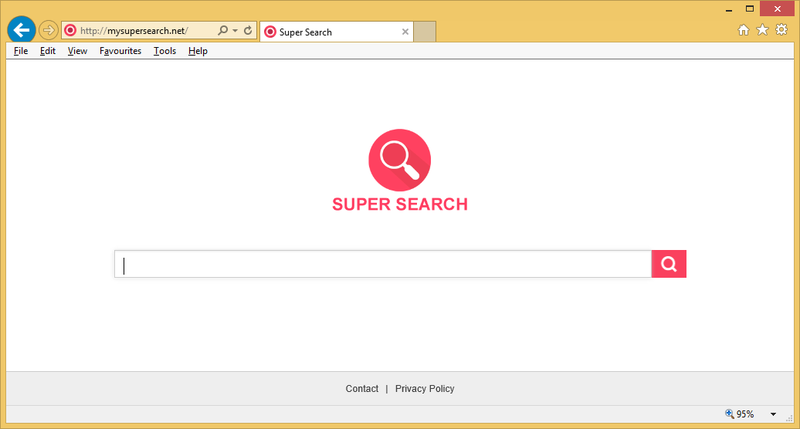 Mysupersearch.net is a suspicious search engine and a browser hijacker. It is a low-level infections, so while incredibly annoying, it should not do harm to your computer. It will make changes to your browsers and prevent your from undoing them. It will then proceed to redirect you to sponsored pages so that it could help site owners make money. It may even be able to lead you to malicious sites where you could encounter malware. The obvious choice of action right now would be to delete Mysupersearch.net. If you continue to use it, you could be putting your computer in danger. You should also start paying attention to how you install free programs because Mysupersearch.net installed because you let it. Albeit, unknowingly. We do not recommend trusting the hijacker to provide you with anything useful. Remove Mysupersearch.net. The hijacker arrived into your computer via freeware bundles, and that means that you allowed it to install yourself. It was attached to free software as an additional offer and you did not notice it. To be able to prevent unwanted installations, choose Advanced or Custom settings and in them, deselect every single extra offer. Do not allow any of them to install. If you do, you will be constantly stuck having to delete Mysupersearch.net and similar threats over and over again. Using Default settings is also not something that you should do because those settings will not show you anything. You might be confused when you open your browser, be it Internet Explorer, Google Chrome or Mozilla Firefox and notice that Mysupersearch.net loads every time. This is happening because Mysupersearch.net has been set as the homepage and new tabs of all browsers. If you do not remember allowing those changes, that is pretty normal. If you try to make alterations to the browser while the hijacker is still on your computer, you will not succeed as the hijacker will just keep changing them again. The only way to do this would be to first remove Mysupersearch.net and only then change settings. Until you do this, you are stuck with it. The site does not seem to be dangerous and it may not be but do bear in mind that some hijackers are able to lead users to malicious content. In general, the search results provided by your new default search engine may contain sponsored content, which makes them unreliable. We suggest you uninstall Mysupersearch.net and until you do, avoid using it. Mysupersearch.net removal should not cause problems. However, if you try to erase Mysupersearch.net manually, you will have to find the hijacker yourself, which may take more time than you think. This is why we recommend you use professional removal software to eliminate Mysupersearch.net. The program would do everything for you and make sure that the hijacker cannot renew itself again.